Ben Haggerty (born Juin 19, 1983), known by his stage name Macklemore (/ˈmæk.ləmɔːr/ MAK-lə-mor) an umwhile Professor Macklemore, is an American rapper, sangster, an sangwriter. Syne 2000, he haes independently released ane mixtape, three EPs, an twa albums. He haes significantly collaboratit wi producer Ryan Lewis. 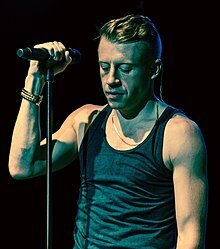 ↑ "Macklemore Biography - Facts, Birthday, Life Story - Biography.com". ↑ Scott, Chey (February 22, 2013). "How to pronounce rapper Macklemore's name". The Pacific Northwest Inlander. Retrieved June 23, 2013. ↑ "We are MACKLEMORE, RYAN LEWIS and FENCES. Ask us anything". Reddit. August 7, 2014. Retrieved August 8, 2014. Mack-La-More is how it's pronounced. Should have picked an easier name to say. This page wis last eeditit on 29 August 2018, at 20:58.